This walk explores an interesting sangle (map) on the Dent de Crolles, and because it isn't very long, easily allows a little exploration of the Grotte du Guiers Mort, the main resurgence cave for the massif's drainage, and the portal into 60 km of integrated cave passages. Note that it needs to cross the Guiers Mort stream which is impassable in flood conditions. The Perquelin valley is a narrow valley that runs south-east from St. Pierre de Chartreuse for about three kilometres to the hamlet of Perquelin. Drive to the top of the road, and at its conclusion, continue along the forest track for 100 metres, where you will find a car park (990 m grid ref. UTM 31T 72314 50237. Our first target is to find the entrance to the Guiers Mort cave. From the car park follow the forest track past a clearing, until you cross the Guiers Mort stream, and also get a glimpse of its waterfall above. Immediately on the other side of the bridge, a path ascends pleasantly through the woods, passing the Fontaine Noire - a captured water source which is the resurgence for the Chaos of Bellefont area above. Continue on the path uphill for a few minutes, then take the next junction to the right, which soon leads to a forest track. Turn right, and after 100 metres, turn left just before the Guiers Mort stream, some 10 minutes after leaving the Fontaine Noire. A pleasant path rises through the forest, until it descends to a set of metal "stepping stones" across the stream, with the imposing cave entrance above. You can, however, carry on and reach the cave entrance by an easy cable-assisted traverse. Once up the zig zags (or across the short traverse), cross over to the imposing entrance (1310 m) which you will reach about an hour after leaving the car. This is a lovely spot, and a good place for breakfast. The Grotte du Guiers Mort is the bottom entrance to the world-famous 60 km long Dent de Crolles system of caves, and its entrance chambers may be explored safely providing you have adequate lighting (which includes a spare), and the water levels are reasonably low. If you follow the main passage up some boulders and round to the right, you will arrive at a large chamber with a lower passage going off at floor level. Entering this, you are immediately hit by a veritable gale-force draught. The low passage only lasts three or four metres before entering another high chamber. This is the Climber's Chamber, which is as far as we can go, but speleologists can progress into the heart of the mountain by climbing up to a passage in the roof. Once the cave has been explored, you need to reach a path which ascends following the base of the cliff. You can reach this from the cave mouth either by clambering across an eroding gully, or more easily by returning to the stepping stones and climbing up to it via a number of zig-zags on the (true) left bank. The continuing path is at first steep and a little loose at times, although perfectly safe, and is a better ascent than descent route. After climbing steeply, it levels out, and becomes more pleasant. After 45 minutes, there is an easy scramble of four or five metres up the cliff to gain access to a new traverse level which isn't immediately obvious. A few minutes later the route joins the path from the Trou du Glaz and the col des Ayes just at the point where some cables ascend the cliff. The entrance to the Trou du Glaz can be seen 100 metres further on. Climb the cables easily, and follow the path up a few chimneys and across ledges, rising up the cliffs through a line of weakness. This part of the route is fun, but easy, and you gain height rapidly. After another ten minutes, we meet a junction, where the Sangle de la Barrère path leaves to the right. Carry on for ten metres and there is a thin path going off to the left - this is the start of the Sangle de l'Arche et l'Aiguille, a path that picks its way round to the north beneath the cliffs of the Belvédère, and our destination for today. It's a beautiful path, in places passing under some impressive overhangs, and has fine views down into the Perquelin valley. There is some mild exposure where it traverses along grassy slopes, but nothing too serious. In a little under 20 minutes, one is confronted by a buttress with one path going below it, and another ascending an earthy gully. 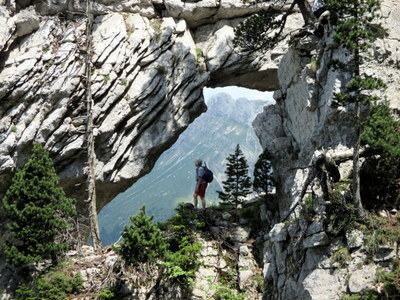 Head up the gully into a small cirque, and to the left you will see a splendid arch surmounted with a pinnacle. Head across to and through the arch, and you will a trace traversing under the cliffs towards a cave. Follow this to find a line dropping back towards the main path. We once disturbed a herd of chamois grazing around the arch, and it was incredible to see them bounding down the cliff back towards the trees. After 10 minutes the path turns a corner at a cairn, and the cliffs are lost. From here the route is not always obvious, but the basic rule is to stay at the same height as best you can traversing above the cirque, and with 15 minutes you will be fighting your way through a patch of nettles to join the GR9. Turn left, and follow the clearly way-marked path through the beautiful prairie, surrounded by dwarf forest, beautiful views, and, in season, a riot of colour from the flowers and butterflies. This is walking at its best. Before long, you are faced with an impressive cliff face descending from the crest to the right. The way on finds a pleasant rake through the cliff, and then traverses a steep bit of prairie. After a further 15 minutes you reach le Prayet, a flat meadow area with a well decorated tree. The GR9 continues to the north, and we turn left towards the cirque down the Sentier du Colonel. Apart from a couple of short steep gullies, this is a superb descent path, which makes its way easily back down. After an hour's descent, you meet a forest track - cross this to a continuation of the path. After another five minutes, turn right at a T-Junction and you will find yourself back at the Fontaine Noire from whence you can retrace your ascent route back to the car.